Hundreds of Italians have gathered in Palermo, Sicily, to commemorate murdered anti-Mafia judge Paolo Borsellino 18 years after his death. He was killed by a car bomb in one the most brutal attacks on Italian justice. Prime Minister Silvio Berlusconi praised Borsellino in a statement for his selfless devotion to duty. After several trials, the truth about who organised the murder of Borsellino, and fellow judge Giovanni Falcone the same year, remains elusive. Statues of the two murdered men were vandalised in Palermo this weekend in a grim reminder that the power of organised crime remains a threat to Italian democracy. It continues to distort the whole economy with protection rackets, drug- and people-trafficking and political corruption allowing Mafia mobsters to win lucrative public tenders. Anti-Mafia prosecutors backed by US justice officials fear that a new gag law being pushed through parliament by the Berlusconi government will hamper all future investigations into Mafia crime. I remember visiting the scene of the carnage shortly after the massive, spectacular attack on Borsellino in 1992 - the huge crater in the street, the dozens of blackened cars, the pockmarked facade of the block of flats where the judge lived, the piles of rubble in the street. The judge and his five police escorts were literally blown to pieces. Startling and troubling new court evidence has emerged in recent weeks that the Italian secret service may have been working in collusion with organised crime in Sicily. At least one Italian secret service agent reportedly knew in advance about the carefully planned murder. 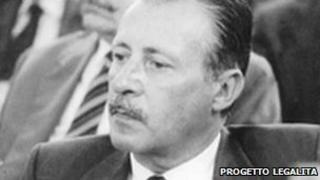 Italian President Giorgio Napolitano wrote to Borsellino's sister on this anniversary of his death that full light must be shed by Italian justice authorities on what he called "the terrible season of slaughters in Italy in the early 1990s".